There is a classic experience that all cyclists must have if they race in Belgium, the Kermesse. 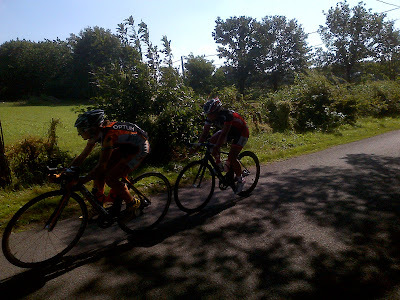 A Kermesse is a local race usually hosted by the town bar and held over a short circuit. I've been told that the length of a lap is closely correlated to the amount of time it takes to drink a beer... These races are a pretty good deal to enter, 10 euros gets you an entry, and you get 5 euros back for a returned number! Today Lex, Karol Ann and I drove about 30 km to get a final day of racing in our legs before the World Champs next weekend. A Kermesse is the perfect opportunity to get in some hard training and time to test out tactics in a low pressure environment. The race followed a 5 km narrow winding loop, with a big wide road leading to the finish line. Lex was away in a small break early on, but it came back. There were sprints for primes every 2 laps of the 16 total laps. I rode near the front and took an opportunity to jump across to a solo rider who attacked on the 4th lap. We quickly gained a decent gap on the field, and gained a max 1 minute advantage. Based on the distance still left in the race (65 km), I thought our chances of staying away were slim, but I did want a good workout so drove the break. To my surprise, we still had an advantage coming into the last lap. Lex and Karol Ann had done a great job covering moves in the peloton behind. I felt like I was definitely the stronger rider and felt confident in my sprint coming to the finish. 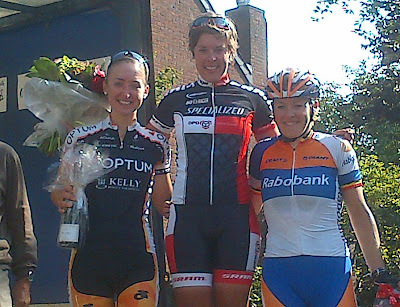 Turns out my breakaway partner was a bit of a sprinter herself, guess it helps to know the competition a little bit. It is always easy to think of a race in hindsight and consider the things you could have done differently. Maybe I should have attacked earlier on in the lap. Maybe I should have played a few more games coming to the line when she sat on my wheel. It was a very close sprint, but I lost out. In any case, it was cool to get my first kermesse podium and a great day of training, even if it wasn't the win. I'm feeling strong leading into the World Champs in five days! Also a Belgian man gave me a link to video footage from the race..